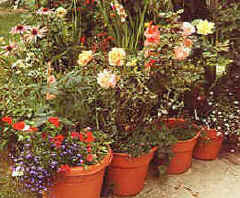 Some shrubs and vines are suited to planting in large containers. This article covers how to plant small vines - with a trellis, and compact-growing roses in containers. Many varieties of clematis are ideally suited to container growing. Special care must be given to choosing the right container, the right support, the right soil and of course the variety - just right for that special spot. Mandevilla and Passion Flower, and other tropical vines are suitable for planting in containers that can overwinter indoors. The minimum size of a suitable container is 18" wide by 18" high by 18" deep (45cm x 45cm x 45cm). In picking a container, metal or any material that conducts heat should be avoided. Stick with pottery, plastic or a long lasting wood like teak. A potting soil with a high content of coarse peat moss will help retain moisture but also provide sufficient drainage. Proper support is very important. If you are going to grow your clematis against a wall, a trellis of some sort is required. In lieu of a trellis sweet pea netting stapled to a fence or wall serves as an inexpensive and effective support. If you wish to have your container free standing, a tripod of bamboo or cedar stakes works very well. Or, you can choose one of the metal or heavy-duty plastic or wood obelisks now available. A tripod of strong canes makes a good free standing support. Many different trellises or obelisks work equally well. A tower structure like an obelisk is often heavy and wide enough to go around the pot diameter. If the vine and it's pot are put into a larger decorative container, this works well. If put against a wall, it will withstand wind, too. If your container is large enough, annuals or a ground cover can be planted on the surface. 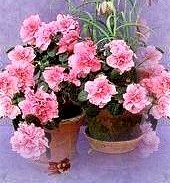 Feed and water often to encourage blooms all summer. Choose rose varieties that are naturally compact. Select a rose that will stay in scale with the container without much heavy pruning (see a list of the best roses for pots below). In terms of size, 24 to 36-inch-wide containers are ideal. For durability, lean toward cast stone or molded resin containers. While the popular half-whiskey barrels are a good size, they tend to decompose in wet climates unless they are heavily treated with preservatives. Teak is a better wood for durable planters. Follow the planting steps 2 through 5 above for clematis. Miniature rose climbers are also suitable for containers, and may require a small trellis or obelisk. See the Selecting Roses article for Miniature Climbers - in the Climbing Roses section.